The Volunteer Legal Services Corporation (VLSC) is proud to award Sally Elkington with the Pro Bono Leadership Award for her ongoing support of pro bono legal services in Alameda County. Sally has been helping people find solutions to their debt problems for over 20 years. In 1989, she established Elkington Law, a firm specializing in consumer and small business bankruptcy, and recently joined forces with Jim Shepherd to create Elkington Shepherd LLP. Sally is a firm believer in the idea that bad things happen to good people, which is why she feels it is important for clients to free themselves of the shame associated with being in debt. Her commitment to helping people out of really bad financial situations has motivated her to lead trainings on assisting low-income people in bankruptcy so that more attorneys can have the tools necessary to assist those in need. A VLSC Board member for many years, Sally continues to be an integral part of the development of our bankruptcy clinics. Help us celebrate the work of Sally and the rest of our award recipients on May 5th at Justice for All: Celebrating Pro Bono! We sat down with Sally to learn a little more about why volunteering with VLSC is important to her. How have you seen VLSC help provide equal access to justice to people confronted with insurmountable debt and potential bankruptcy? This is a no brainer. Bankruptcy is a complicated process. Many if not most of the folks who come to our clinic would never be able to file for bankruptcy on their own. TThey would be stuck getting constant calls from collection agencies – and I mean five or ten calls an hour. These collection agencies bought the debt from the original creditor, and paid pennies on the dollar. Then they call people with no money or assets, and try to intimidate them to beg, borrow or steal money to pay the full debt (plus late fees and interest). These are not “deadbeats” – they are people living on the edge of poverty. They have reached a financial breaking point, usually due to some sudden event – an unexpected medical crisis, a death in the family, an eviction – and now they have unpaid debt that will never go away except through bankruptcy. Our clinics serve this population, and makes it possible for them to access the complicated bankruptcy system, and find their way to a fresh start and peace of mind. If that isn’t equal access to justice, I don’t know what is! Is there a memorable case/client that you’ve helped that benefited from a pro bono attorney/pro bono assistance? That’s a more difficult question. Is there one memorable case or client? No. When you finish completing bankruptcy paperwork and explain their next steps, generally you can see the relief in their eyes. That is what is memorable. It’s the effusive thanking and blessings and appreciation that is extended to me that is memorable. It’s knowing that today I helped someone who, but for the bankruptcy clinic would not have been given this chance to turn their life around. There is no better feeling than that, and believe me that memory and feeling goes a long way in my life. You have served on the VLSC Board, taken the lead in developing and volunteering for VLSC’s multiple bankruptcy clinics, donated your time and money — what inspires your long-term support of VLSC? There are so many people that need help and so few people to help them. Bankruptcy attorneys are having a difficult time right now. We say in the bankruptcy world, “what is good is bad and what is bad is good.” The economy is doing well right now, that is good. There are fewer people who need to file for bankruptcy and are finding other ways out of debt, that is good. Unemployment rates are down, that is good. The Affordable Health Act (Obamacare) is creating a safety net for people who might not of otherwise been able to pay their medical bills. I could go on, but I think you get the picture. These are all good for the middle class person who is trying to work their way out of debt, but for bankruptcy attorneys and our own livelihood, not so great. My point being that bankruptcy attorneys are working very hard right now just to pay our own bills and this is a time when it is hard to carve out pro bono hours to give to the clinic. I guess for me, stepping outside of my own worries and helping others is just in my DNA and the reward is so great, that it helps me remember how fortunate and privileged I am to be a lawyer. Giving back was part of my lawyer training. I went to a public interest law school where I was taught that it is our responsibility as attorneys to use our skills and knowledge to help those who otherwise can’t afford our help. It just isn’t a question for me, it is part of my duty in practicing law. And as I have said, in the long run, I get more from doing this type of work, than the paid work I do (don’t tell my law partner I said that). If you weren’t a lawyer, what career would you choose? I would teach. I love sharing what I know. Just ask my friends when they wake up from my droning on and on. Seriously, I was a teacher for many years before going to law school and it was how I supported myself in law school. I miss it. Again, there is something very special about helping students understand something they didn’t understand before. Sometimes you can see the “click” of understanding, that ah-ha moment in their eyes when it all starts coming together. What would you want to share with others about the impact of pro bono work in our community? If every attorney and judge in Alameda County would donate either 10 billable hours a year to VLSC, or equivalent dollar amount, we could help every financially marginal person in the county with their legal issues! We would not have to turn down any legitimate need for help. Wouldn’t that be amazing? 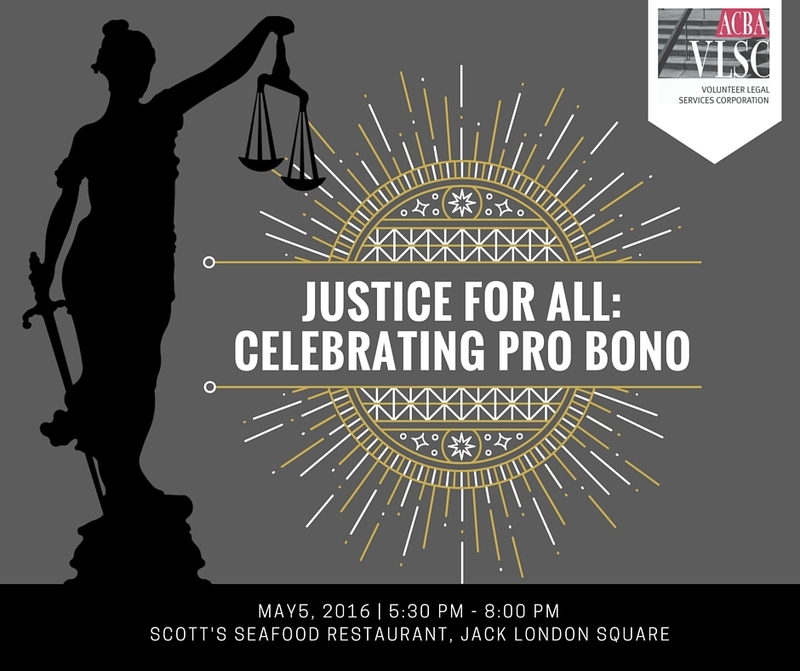 Join us on May 5th at Justice for All: Celebrating Pro Bono as we honor Sally and her fellow award recipients. Buy your tickets today here!